WHAT: Set in New York City during 1981, Abel Morales (Oscar Morales) finds his heating oil company embroiled in a turf war at the worst time possible. He’s just gone into escrow on a waterfront fuel yard that could take his business to the next level, but when a young district attorney (David Oyelowo) launches an investigation into Abel’s company, everything that he’s worked so hard to create threatens to come tumbling down. WHY: Over the course of three movies, J.C. Chandor has established himself as one of the most promising American filmmakers of his generation, and “A Most Violent Year” is his best one yet. A smartly directed character study of a man fighting to uphold the antiquated ideals of the American Dream, the movie is very much a product of its time period, owing a lot to the work of Sidney Lumet and other 1970s classics like “The French Connection” and “The Godfather.” You’d never imagine that a film about the heating oil industry could be so absorbing, yet that’s exactly what makes “A Most Violent Year” so unique, defying the typical gangster movie conventions every chance it gets. 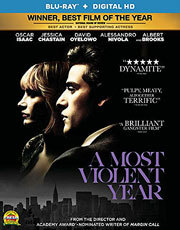 Oscar Isaac has never been better, commanding the screen with an ice-cold intensity that evokes Al Pacino in his prime, while Jessica Chastain delivers a deliciously fierce turn as his mob-connected wife. Much like last year’s underrated crime drama “The Drop,” “A Most Violent Year” is the kind of movie that Hollywood doesn’t make often enough, but with brave new voices like Chandor behind the camera, it’s hard to argue against the need for more just like it. EXTRAS: In addition to an audio commentary by writer/director J.C. Chandor and producers Neal Dodson and Anna Gerb, there’s a pair of production featurettes, an interview with stars Oscar Isaac and Jessica Chastain, and some deleted scenes. WHAT: Jerry Hickfang (Ryan Reynolds) is a socially awkward but overall nice guy who’s just trying to lead a normal life in the wake of a family tragedy. But when he gets stood up by office crush Fiona (Gemma Arterton), only to cross paths with her later that night, he inadvertently murders her in the middle of the woods. At least, he thinks it’s an accident, but Jerry hasn’t been taking his meds lately, which is why he’s starting to hear voices – namely, his loyal dog Bosco and sociopathic cat Mr. Whiskers – urging him to kill again. WHY: Ryan Reynolds has had some really bad luck with blockbuster filmmaking (see: “Green Lantern,” “R.I.P.D.”), but he’s delivered some of his best work on the other end of the spectrum in small indies like “Buried” and “The Captive,” and that trend continues with “The Voices,” a flawed but amusing dark comedy that plays like a strange mix between “Doctor Dolittle” and “American Psycho.” The movie is unlike anything the actor has done before, channeling Norman Bates as the sweet but creepy schizophrenic in addition to voicing the pets that serve as Jerry’s very own shoulder angel and devil. It’s his interactions with them, as well as the reanimated severed heads of his victims that he keeps stored in the refrigerator, that produce some of the best moments, putting Reynolds’ deadpan comic delivery to great use while still allowing the actor to challenge himself in a more nuanced role. 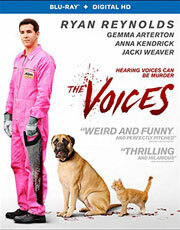 Though the film straddles a fine line due to its off-kilter tone, Reynolds and the supporting cast (including Gemma Arterton and Anna Kendrick) do just enough to make “The Voices” an enjoyably weird genre flick with an unexpected dash of humanity. EXTRAS: There are four production featurettes that cover the making of the movie, the many voices provided by Ryan Reynolds and visual effects, as well some animatics, deleted and extended scenes, and a cast and costume sketch gallery. WHAT: In 1921, Polish immigrant Ewa Cybulska (Marion Cotillard) and her sister travel to New York City to escape the war in Europe. When the two women are separated and Ewa is threatened with deportation, she’s rescued by a seemingly kind man named Bruno (Joaquin Phoenix), only to be forced into prostitution. Stuck in a horrible nightmare, Ewa finds a restored sense of hope when stage magician Orlando (Jeremy Renner) arrives in town. EXTRAS: The Blu-ray includes an audio commentary with director/co-writer James Gray, as well as a featurette on the movie’s visual inspiration. WHAT: The handsome and seductive Nomura (Kazuki Kitamura) is a sociopathic serial killer who preys on the women of Tokyo and posts their grisly deaths online for all to see. Disgraced Indonesian journalist Bayu (Oka Antara) is one of Nomura’s many viewers, and he uncovers his own thirst for killing after a confrontation with a pair of robbers. When Bayu begins posting videos of his deadly acts of vigilantism online as well, it sets off a strange rivalry between the two men. 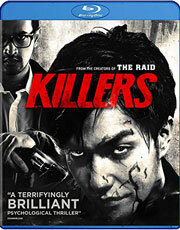 WHY: The sophomore effort from Indonesian directing duo Kimo Stamboel and Timo Tjahjanto (better known as the Mo Bothers, despite being unrelated) features a number of actors from Gareth Evans’ “The Raid” films, which isn’t surprising considering that the Welsh-born director serves as one of the movie’s producers. However, those expecting anything along the lines of Evans’ high-octane action films will be incredibly disappointed, because “Killers” is an entirely different beast – a slow-burning psychological thriller that dives into the mind of two serial killers brought together by the Internet. It’s an intriguing concept for sure, but it never really comes together as well as you’d hope. While the movie divides its time equally between both characters, neither one is given an interesting enough backstory to warrant the lengthy 137-minute runtime, delaying their inevitable showdown in the process. The lack of any police presence (save for one scene) is also ridiculous, especially considering how careless Bayu is about protecting his identity. “Killers” has some good moments, and Kazuki Kitamura is unnervingly creepy as the Patrick Bateman-like sociopath, but it feels incomplete – like the Mo Brothers were trying to say something important and got distracted by their own bloodlust. EXTRAS: Sadly, there’s no bonus material available.